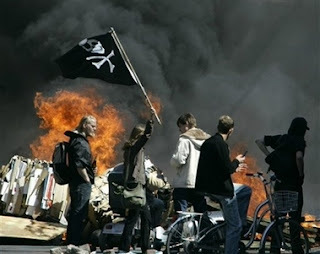 Copenhagen, Denmark - A demonstration organized by squatter residents of the semi-autonomous Freetown Christiania broke out into a riot during which black-clad demonstrators built a flaming barricade across the main road to the area. Protesters were attempting to keep work crews accompanied by riot police, from demolishing an occupied building that had been condemned following a 2002 fire. Police fired tear gas and arrested at least 16 people one of whom was bleeding heavily from his head. The area was taken over and as a semi-autonomous neighborhood in 1971 and recognized as such by the Parliament in 1987, but has recently come under increasing government pressure to conform to the ideas of private ownership and adhere to Danish laws. The change began in 2004 following the election of a center-right government. Anarchist and squatter groups have been very active in the city following the violent police eviction of the Ungdomshuset (Youth House) two months ago. Since then activists have organized dozens of actions including a weekly one each Thursday in response to the eviction.